Let’s run, she wanted to beg him. Let’s run, let’s run . . . But then again, she knew what happened to a person on the run. They chase you and then they throw you to the ground and they rip you and break you . . . I have read this book last year and enjoyed myself quite a lot. It started of extremely creepy - with scenes so brutal, repulsive and downright disturbing, I was sure this was going to be one of the creepiest, most horrific books I have ever read. But then, it kind of slowed down towards the end and got more convoluted with every chapter. The creepy atmosphere thinned down and eventually disappeared all together, and all that remained was a pretty generic murder mystery. Not a bad murder mystery by any standards, but not quite a great one either. What we have here is a strange combination of a murder mystery with vague supernatural elements. Being big on horror and supernatural stuff (especially ghosts), I expected to love this book. I didn't. I liked it quite a lot and still thought it was well written, captivating and very uniquely put together, but because of the wordy prose and the far fetched plot line, I can't say that I loved this book. The book is written in a pretty captivating prose. The narration is at times a bit too dragging and unnecessarily metaphorical, but overall the author does a decent job of moving things along at a nice pace and keeping the reader engaged. At the beginning, the atmosphere is creepy and haunting, there are many scenes that are downright disturbing and nauseating (scenes like cats feeding on the dead girl's body and - get that - the girl being able to feel all of it), but after a few chapters and some flinch-worthy shockers, the level of creepy and disturbing decreases noticeably. Overall, this book is very different from anything I've read so far. I think strange would be a good word to describe it. The idea of seeing, hearing and feeling everything even after you're long, long dead, is a very disquieting one. I didn't think it added much to the plot line itself, but it was an interesting new concept for sure. 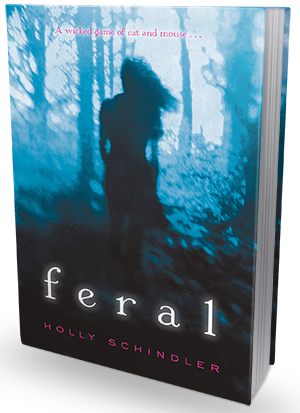 In the end, though I enjoyed Feral, I also hoped for a more jaw dropping ending. Nevertheless, this was a solid supernatural thriller and murder mystery.